Yesterday we were outside playing and having a great time when Gray spotted a bumble bee in the garden. He was fascinated and pointed to it while looking at me, a sure sign that he wants to know what it is and wants me to name it. I told him it was a bumble bee and he looked confused. 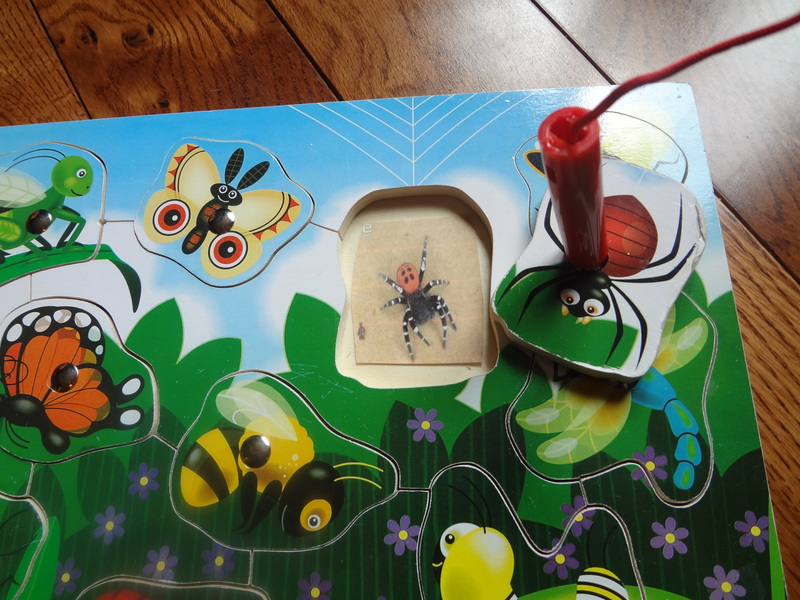 He has a game, it is a bug catching game with bugs that have bits of metal attached and you use a wooden bug catching net with a magnet attached to lift (catch) the bugs from the wooden puzzle. He has had it for about a month and a half and absolutely loves it! It is still one of his favourite toys and he loves to name the bugs and if I ask him to pick a certain one he always knows exactly which one I’m talking about. So it didn’t really make sense to me that he didn’t know what it was when he always names it when we play with the puzzle. 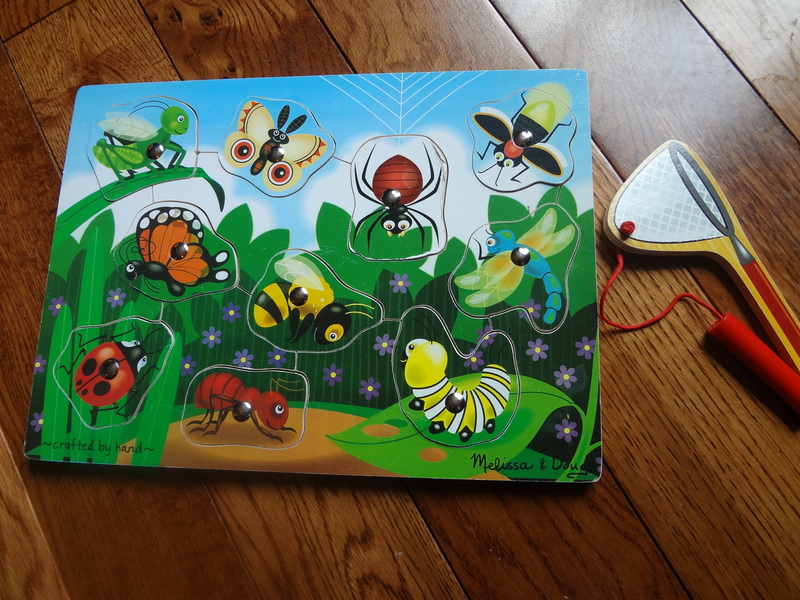 I wanted to help him make the connection between the cartoony bugs on his puzzle and what they look like in real life so while he napped (sometimes I think that is what I should have called this blog) I looked up pictures of the bugs featured on the puzzle on line. 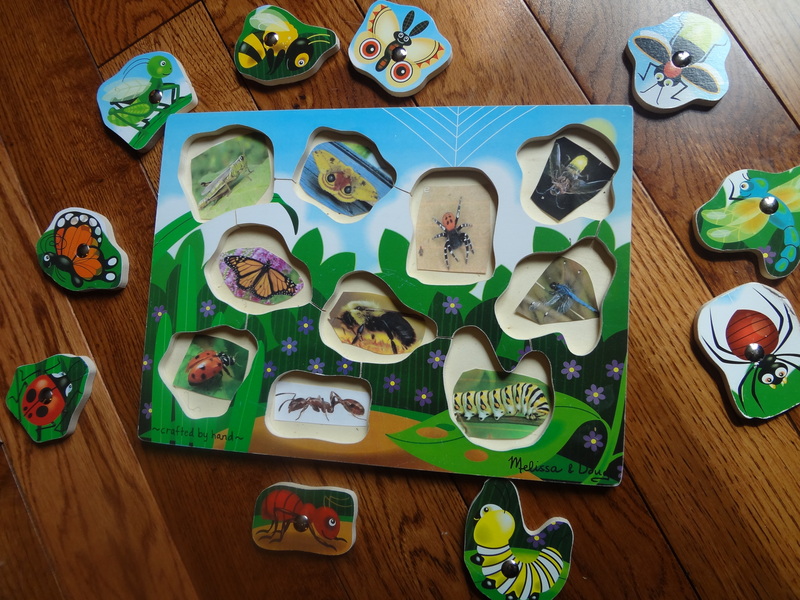 I sized them up and printed them off, trying to find bugs in that looked fairly similar to the ones on the puzzle in species and colour, and taped them to the inside of the board, so that they would be visible when he pulled the corresponding piece out. It turned out wonderfully and later in the evening when he wandered over the game he was delighted to find the pictures underneath the bugs! It also helped him figure out which piece fit back where when he put them back in so he could play again. Here is what it looked like when I was done. Now he is in bed and I am looking forward to sitting back and enjoying some chocolate drizzled apple chips, I hope this gives you some fun ideas for play and learning at home, and that you will join us again at Excite and Explore! 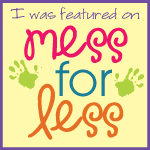 Categories: Fun at Home | Tags: Bugs, Puzzle, Toddler | Permalink.